Pottery that brings a smile to your life. Our company handcrafts all products within 2 weeks, although custom orders may take longer depending on production schedule. Oftentimes, orders process faster than that but we can’t guarantee a faster processing time. Check a listing carefully to understand if a product is pre-made and ready to ship or if the product is ordered before it’s handmade. Both are handmade but the pre-made is shipment ready while the made-to-order products take 2 to 6 WEEKS to be created for you. The product(s) you receive might vary slightly from the product picture due to the nature of your product(s) being 100% handmade to order. Colors on computer monitors vary. * Dishwasher and microwave safe for most plates and dishes. * Crackle glazed pieces should be hand washed and not used in microwave. * For larger items it is always best to hand wash. Custom orders can have a lengthier processing time. Especially around Holidays. We ship all International products through USPS international. ***Please inquire about international shipping costs, as we do not have them calculated except by actual orders. Firecat Pottery is not responsible for duty or brokerage fees for international shipping. Ww will calculate shipping according to your order. Selecting expedited shipping during checkout does not ensure a faster processing time. Your product may still need 5 days to 2 weeks to be handmade. 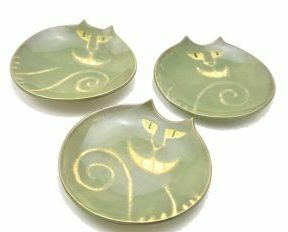 Firecat Pottery will the information you provide on this form to be in touch with you and to provides updates, emails, newsletters, and marketing.